Roughly a year after I started the Alyce's World blog we have already reached our 200th posting. So much has happened in the past year it is hard to put it all down in text. Last year around this time we were worried about Alyce's speech development. Now she is a chatterbox describing everything she sees. She has gone from using single words to whole sentences. Alyce ate her first cheeseburger and taco. She fell into and out of love with The Little Einstein's TV show. Mom got pregnant and gave birth to Alyce's baby brother Luke. She shared a toy for the first time. Moved to a big girl bed. Alyce is a completely different girl than a year ago. She is a great kid that gives back so much more than she takes. I can't wait to see what the next year brings. Most likely some potty training perfection and starting preschool. The below picture is a perfect example of what I love most about my little girl. 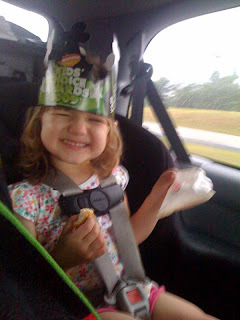 This is a picture of her in the car on vacation with Mom, Luke, Grams, and PaPa. 0 comments on "200th Post"